30 in 30 – Done!! If you’ve been following my blog, you know that I’ve been doing Leslie Saeta’s 30 in 30 challenge. That’s 30 paintings in 30 days. Her suggestion for today is to make a collage of your paintings, which I have done. This is a great idea and I did manage to get it done. It’s not perfect, but not bad. (And, oh yeah, mine aren’t in order.) If you want to try the collage thing out yourself, it was done through picmonkey. Now the interesting thing – check out Leslie’s blog on this final day. You can get a peek at all of the paintings by each artist in one shot. This piece is very interesting. I’ll go back in a couple of days and check out my fellow artists. 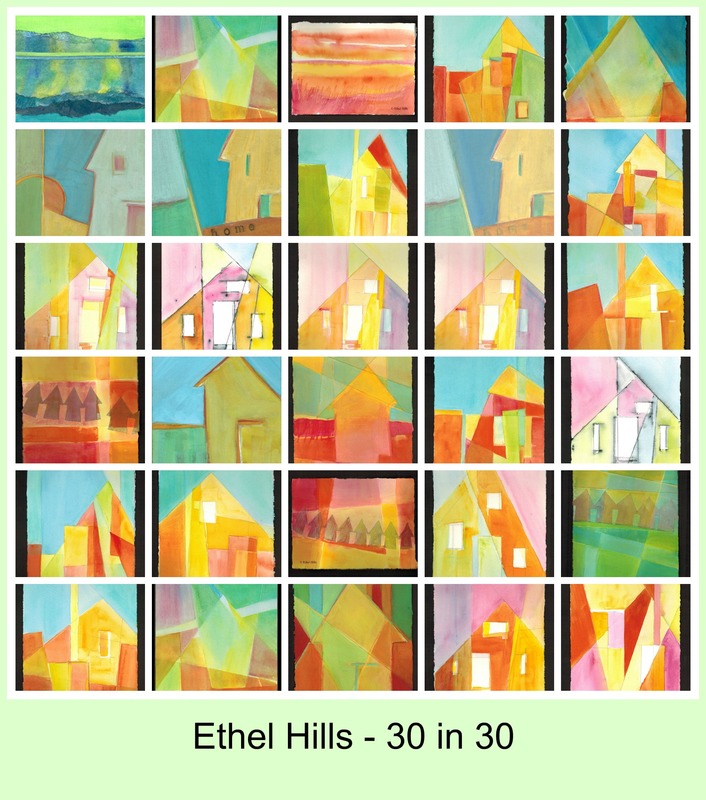 A month ago, I signed up for Leslie Saeta’s 30 in 30 Challenge – 30 paintings in 30 days. I’m painter #346 out of 432 who signed up. I’ve completed the challenge – posting 30 paintings in the month of September. And quite honestly, I’m glad it’s over. I’m stubborn, so I wasn’t going to skip a day. (Even when it would have made more sense to skip.) I’ve painted ahead and posted using my Kindle Fire when I was away from home. It’s been a very busy month and it would have been a lot simpler without this challenge. That’s not to say there weren’t benefits. I’ve had “shelter series” on my to-do list for quite a while and this gave me a chance to explore this idea. Unfortunately, while I’ve done several small paintings, I haven’t had the time to do any larger paintings and really explore the options. I’m hoping that October will give me the time to expand on some of these ideas. Most of the paintings I’ve done this month are small watercolor studies. I still haven’t figured out how to present these. In most of these I’ve painted to the edge, so I think they might look better floated than matted. I may wait until I’m closer to an exhibition of the “Shelter Series” before I worry too much about it. Another possibility is to frame just a few of them, maybe 6 or 8. 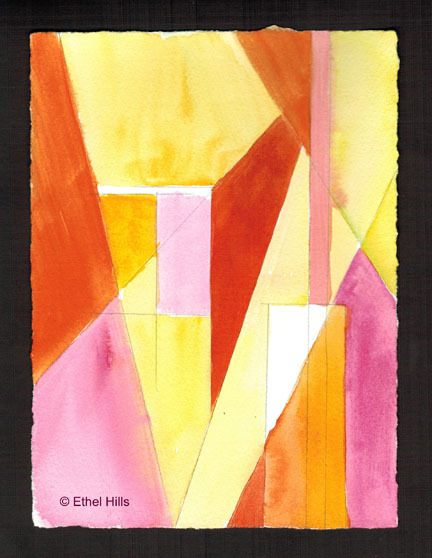 I love watercolor, but the matting and framing can be time-consuming and expensive. Here are the next two paintings in the 30 in 30 challenge. My initial idea on these was black & white – black ink – white paper – maybe a little water. And that was kind of interesting, but something was missing. I couldn’t resist adding some color. These are the last two of the paintings I did last week as part of the challenge. I’ll be back in the studio tomorrow. It will be interesting to see just how different those paintings will be. We’re kind of in the home stretch now. Just a few more paintings to make the 30 we all decided to do in the month of September. Here are the next two pieces in my current series. Working in this very small format is a great way for me to quickly explore lots of options. Although some of these will never be finished paintings, “out in the world”, I’m still toying with the idea of at least displaying a lot of them together. One possibility is to just take a wall in my studio and tape a lot of them up, probably using masking tape. Another option would be to do a clothesline type display. Any suggestions would be helpful. I’m enjoying working on these paintings which will be the basis of my “Shelter” series. These are #20/30 and #21/30 in the 30 in 30 challenge. By the end of next week, I will have spent most of a month working out ideas for this new series. I plan to spend most of October working some of these ideas into finished paintings. It will be interesting to see how these ideas may translate as larger paintings.